✴Bartolomeo seems to have been an executor after the death of Sante di Apollonio in 1486, in which capacity he received payment for the upper panel (1485) of the Decemviri Altarpiece (see below). Some scholars believe that Sante di Apollonio belonged to the so-called Workshop of 1473, which produced the important panels depicting miracles of St Bernardino of Siena that are now in the Galleria Nazionale. (Follow the links in the page on the Workshop of 1473 for more details). Two of the eight panels (the bottom two on the right, illustrated here) are specifically attributed to him. 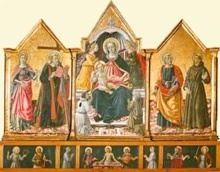 This triptych from the Oratorio dei SS Andrea e Bernardino was generally attributed to Fiorenzo di Lorenzo until Michael Bury (reference below) discovered a document in the archives of the Confraternita di Sant' Andrea della Giustizia that records its commission from Bartolomeo Caporali and Sante di Apollonio del Celandro. The altarpiece was originally in the confraternity's church of Santa Mustiola, and it moved with the brothers to the Oratorio di SS Andrea e Bernardino in 1537. It was given to the Commune before 1872 and entered the Galleria Nazionale in 1895. ✴In the central panel, two members of the confraternity kneel before the Madonna and Child, who are flanked by a pair of angels. It is significant that St Mustiola holds the Virgin’s wedding ring, because this relic (the Santo Anello), which had long been associated with Santa Mustiola at Chiusi, had been stolen in 1473 and brought to Perugia. (It is now in the Cappella del Santo Anello in the Duomo). •St Jerome and a soldier saint on the right. This small panel in tempera, which depicts St Sebastian tied to a column, came from the Pieve di Santa Maria, Castello di Ripa, outside Perugia. It bears the coat of arms of the Narducci family and contains a portrait of the donor. It is attributed to Sante di Apollonio and seems to have been inspired by a similar work that Andrea Mantegna painted in Padua after an outbreak of plague in 1456-7. It is now in the Galleria Nazionale. In 1484, the commission passed to Perugino, who was to complete the main panel within four months and to paint the upper panel within a year. The subject of the latter was to be the Madonna della Misercordia with portraits of the Decemviri, who would presumably be depicted sheltering under her cloak. When Perugino left the city a month later without having started the work, the commission passed to Sante di Apollonio, who executed the upper panel, which depicted the Madonna della Misercordia. He seems to have lost the commission in 1485, and he died in the following year. This upper panel was subsequently painted over.